As you may have noticed from my last few posts, we have finally bought our own house! This is so exciting as we can finally decorate it as we want and make it into our dream home! This week I am sharing with you a post I did in collaboration with* Order Blinds. I got a chance to order a blackout blind of our choice and do a review. One of the spare bedrooms in the house is facing the road in the estate, so it would definitely need something to block out the (occasional) traffic light. Here is the before picture. 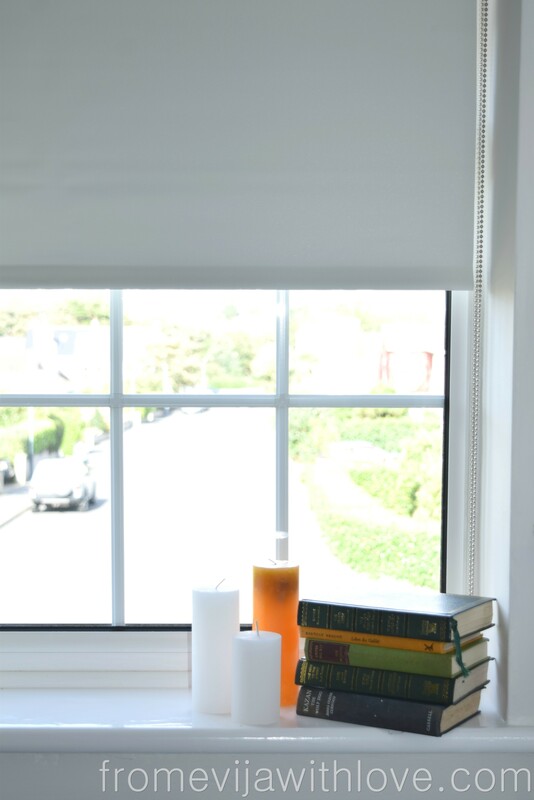 Order Blinds offers a wide selection of various products so there is something for everyone. Personally I prefer the roller blinds to the vertical ones, so I had a few options to choose from. I was quite interested in the thermal range, as this blind not only offered a lovely design but also the benefit of keeping the room warmer in the winter and cooler in the summer. I went for the classic cream, as I wanted to keep it nice and classy. This would also allow me to change the colour scheme as and when I wanted to. It was really easy to order and you can choose the finishing touches to suit your taste and budget. The delivery came within days! I was very impressed with the service and the speed of the delivery. The blinds are made to measure so I was expecting it to take its time, but surprisingly it arrived a couple of days after the order! The blind was nicely packaged and I was so excited to unwrap it . I took the blind out of its packaging and it seemed quite big so I ran upstairs to check the window! PHEW panic over – it was a perfect fit! If you are struggling with the measurements (like I was), there is a very helpful video on the website. I got my husband on the case to do all the hard work. Well saying that, it turned out putting up the blind was quite easy. The instructions were easy to follow and (with the right tools) it literally took us a few minutes to drill the holes and put the blind up. And by us I mean Shaun! The blind also came with several warnings. If you have children, PLEASE MAKE SURE YOU FOLLOW INSTRUCTIONS AND ENSURE THE BLIND IS SAFE! Here is a helpful post to keep your children safe. I put up some lovely curtains to compliment the blind and I absolutely love it! *Disclosure: This post has been made in collaboration with Order Blinds, and the blind for this review has been provided to me free of charge. You can view our full policy here. All opinions and ideas expressed are my own and not influenced in any way. Clarissa, it was very easy to install and it makes such a difference! It looks lovely and also blocks the light out so it will be perfect for you if you are a bad sleeper. I will see how it is in winter with keeping the heat in the room as well..